Krispy Kreme UK and GLAMOUR Magazine have collaborated for a second time and have released GLAMOUR Glaze doughnuts in line with London Fashion Week. They are available in two flavours, strawberry glaze and orange glaze. 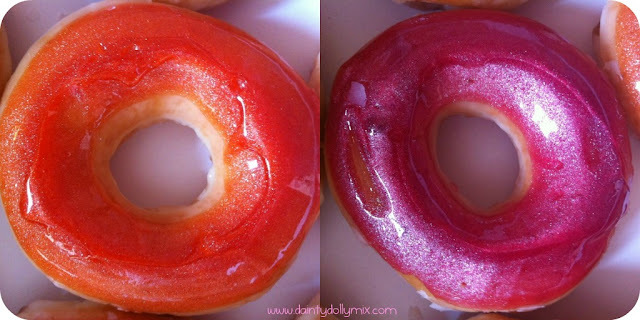 Both have a fruity flavoured glaze that is so sparkly it is reminiscent of lipgloss! Perfect for beauty lovers who like to indulge in doughnuts! Enjoy a single GLAMOUR Glaze at £1.35, or share your fashion week highlights among friends with a Dozen Doughnuts packaged in a bespoke black GLAMOUR Glaze box! To find your nearest store (there is now one in Leeds! Yay!) please visit krispykreme.co.uk. These look amazing! Why isn't Krispy Kreme in Cumbria yet? How yummy ! I love KK's but it is rare I will have one, special occasions only. Love Krispy Kremes although there isn't one any where near me! I buy a stash when I go to London!! Really like the look of the Strawb one! I love Krispy Kremes and the smell when your walking past where they are being made. I may buy ONE pink doughnut as a treat when I am in town becasue it could go terribly wrong if I have a big box of doughnuts in my hand, meaning that I will find myself chomping on the last one and then wondering where they all went! Holy crap that's sooo cute! Oh my I'm not sure I would've been able to eat them too dang adorable! Just had to comment on this because I've just posted a blog about these Krispy Kremes too- found a 2 for 1 voucher for the Glamour Glaze doughnuts! Don't want to appear to be spamming your comments but you can find the voucher on my blog :-) Brilliant if you need a serious sugar fix or are thinking of sharing! I never knew Krispy Kreme was in the UK as well! I personally have not found a better doughnut here in the US. So jealous, I want a Fashion Week treat!